This could solve problems of passive plays in the engame. Professional Fortnite competition shows that the storm circle mechanics might not be fun as it is now. 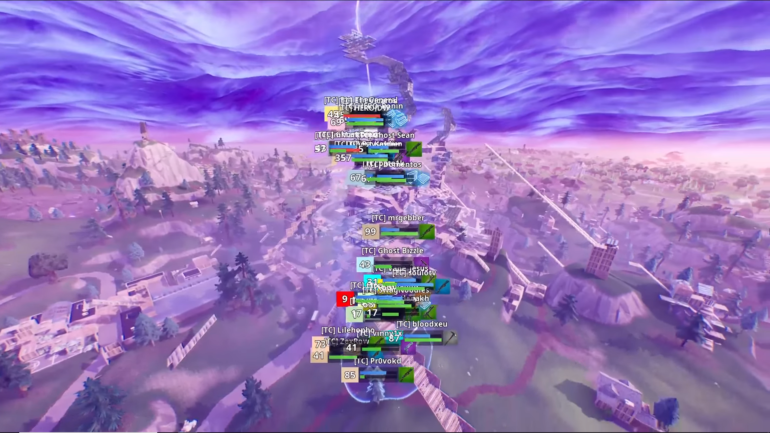 Last week’s Fortnite Fall Skirmish grand finals had an average of 60 players alive after four storm circles, and sometimes as many as 10 when the last storm circle started shrinking, leaving no safe zone in the map. Professional players manage to stay alive on late game by creating tall buildings while the circle is closing horizontally. Several players stay inside them at different heights. If they manage to stay safe until the last circle closes, the winner might be the one who heals themselves the most while all of them take storm damage. And this kind of ending in an aggressive and dynamic game like Fortnite isn’t fun. But Reddit user SchwarzENTegger shared on the Fortnite subreddit an idea for turning the cylindrical storm circle into a dome. The storm would close in as a hemisphere, which would start limiting the maximum height players can reach without taking storm damage. Now, the storm doesn’t move vertically and players can reach any height without taking damage. The Fortnite Reddit community loved the idea. In a dome-shaped storm, players would be forced to become more aggressive in the endgame since the distance between them becomes smaller. Heal-offs probably would never happen again because players wouldn’t have room to build, and matches would stop having boring endings. But this requires more mechanics to change. Items that boost and teleport players upward such as the Rift-to-Go and the Jump Pad could make players take storm damage in late-game domes. These items have to be adapted to not let players move beyond the vertical limit of the dome, or they will become useless in the endgame since players can start taking storm damage if they use them. Epic Games is always on Reddit, and it’s likely that someone at the company has seen this post by now. The company has accepted some suggestions from this community in the past, like the recent Slurp Juice changes and the return of a standard mode during Fortnitemares. We will have to wait a bit more to see if the storm circle will become a storm dome.